to a hint of tradition and a strong dose of distinctive attitude. A unique chassis with a 25° rake delivers unmatched handling &amp; balance even when fully loaded. Without the added weight of a fairing, the Indian Springfield™ can carve corners like no other bike in its class. With standard front driving lights, the Indian Springfield™ illuminates the road for safe riding, day or night. This stylish windshield provides outstanding wind & weather protection to make every ride more comfortable. With Quick Release technology, it can be installed or removed in less than a minute with no tools. The Thunder Stroke 111 produces 150 Nm of torque with tremendous power at low RPM. You can accelerate hard with power to spare in every gear. Never fumble with a key again. With the proximity key fob in your pocket, just climb on, start it up &amp; ride away. Misplace the fob? Just enter your personal security code and ride on. It’s the most powerful visual icon in motorcycling. Since 1947, this illuminated Headdress has graced the front fender of nearly every Indian Motorcycle, showing the way on the open road. This heritage-inspired instrument panel has been brought forward into the 21st century while maintaining its timeless style. The badging on the Indian Springfield™ is powerful, stylish & iconic. 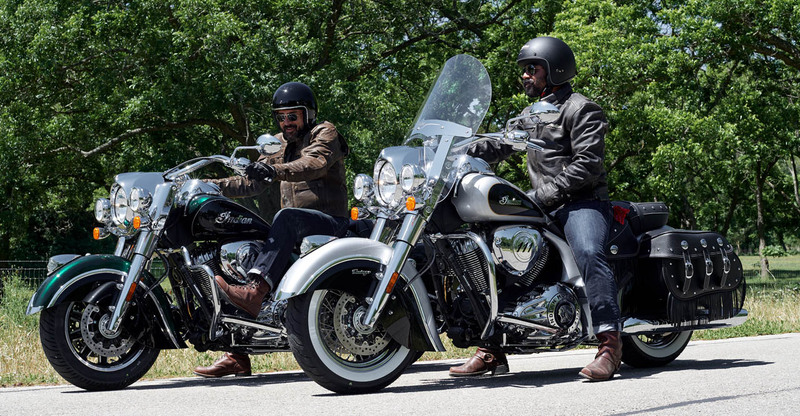 Since 1901, Indian Motorcycle has stood for the ultimate in power, performance & style. Chrome is the new standard, and you’ll find it from end to end on the Indian Springfield™. This cushioned, 2-up seat features premium grade genuine leather that has been treated to withstand the elements and retain its natural beauty. Unique to Springfield, stud and stitch details complete its look.